The Gold Magic Spiral Gold Recovery System will allow you to work more material faster and recover more gold than ever before with no need to buy additional equipment! 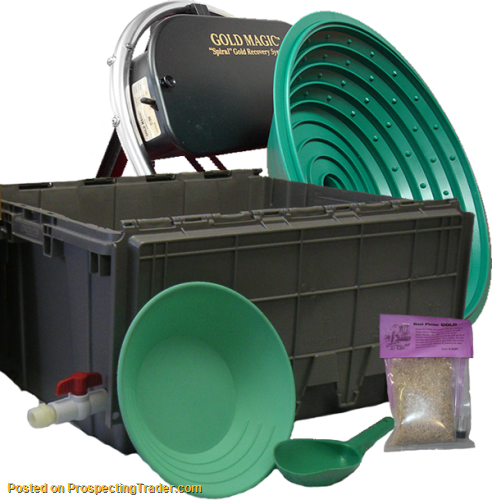 This compete kit contains a Gold Magic Model 12E, a Wet Separation/Storage Tub, a Scoop, a bag of Panning Gravel, and a small finishing pan. Everything you will need to get started prospecting! 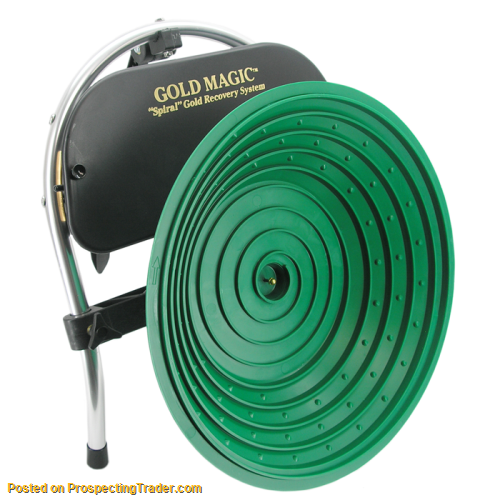 The Gold Magic 12E will work dry to highly concentrate material, and it will work wet in a tub to separate black sand and gold. And it can work right down in a stream to process material so you take home clean gold. And... you get FREE SHIPPING! A comprehensive Owners Manual, a warranty card covering 1 year manufacturer's warranty, and how-to DVD is shipped with every Gold Magic 12E so you will be set up and ready to run wet or dry in minutes!